This is still one of my favorites. 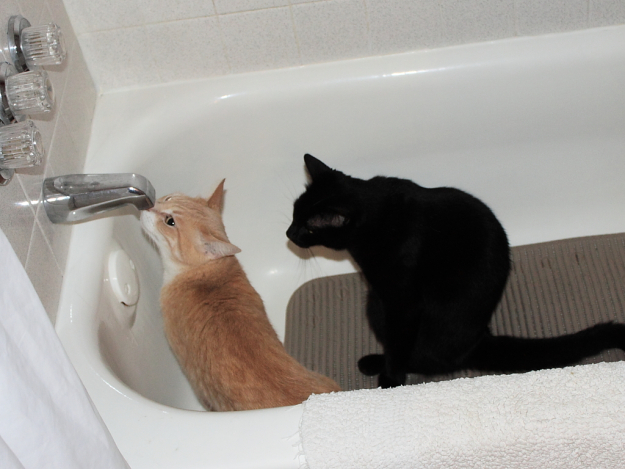 This is Frankie and Puck in our bathtub. See if you can come up with a funny caption and then click here to see what I came up with. This entry was posted in Uncategorized on February 16, 2017 by Charles Huss. That would be an unpleasant but funny surprise. 🙂 😀 We Want Water,We Want Water !!! I can’t think of any, but they look so cute. Hey, Quit hogging the Tap! Frankie, you are about tapped out – it’s my turn! So how does the water come outta here?? Is that water better than the toilet water?